Lake Manasarovar (Tibetan: མ་ཕམ་གཡུ་མཚོ།, Wylie: ma pham g.yu mtsho ; Chinese: 玛旁雍错 , 瑪旁雍錯 also called Mapam Yumtso, is a high altitude freshwater lake fed by the Kailash Glaciers near Mount Kailash in the Tibet Autonomous Region, China. The lake is revered a sacred place in four religions: Bön, Buddhism, Hinduism, and Jainism. Ladakh is a region in the Indian state of Jammu and Kashmir that currently extends from the Siachen Glacier in the Karakoram range to the main Great Himalayas to the south, inhabited by people of Indo-Aryan and Tibetan descent. It is one of the most sparsely populated regions in Jammu and Kashmir and its culture and history are closely related to that of Tibet. Ladakh is renowned for its remote mountain beauty and culture. The river has a total drainage area exceeding 1,165,000 km2 (450,000 sq mi). Its estimated annual flow stands at around 243 km3 (58 cu mi), twice that of the Nile River and three times that of the Tigris and Euphrates rivers combined, making it one of the largest rivers in the world in terms of annual flow. The Zanskar is its left bank tributary in Ladakh. In the plains, its left bank tributary is the Panjnad which itself has five major tributaries, namely, the Chenab, Jhelum, the Ravi, the Beas, and the Sutlej. Its principal right bank tributaries are the Shyok, the Gilgit, the Kabul, the Gomal, and the Kurram. Beginning in a mountain spring and fed with glaciers and rivers in the Himalayas, the river supports ecosystems of temperate forests, plains and arid countryside. The Tigris is the eastern of the two great rivers that define Mesopotamia, the other being the Euphrates. The river flows south from the mountains of southeastern Turkey through Iraq and empties into the Persian Gulf. 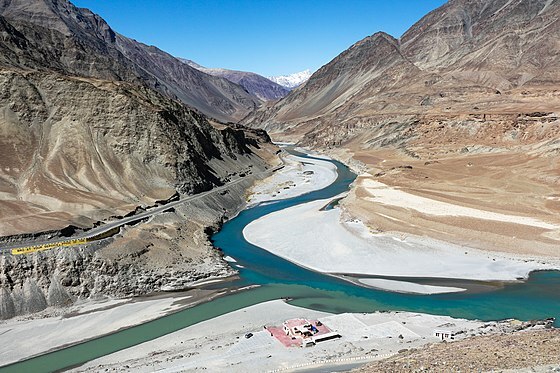 The Zanskar River is a north-flowing tributary of the Indus. In its upper reaches, the Zanskar has two main branches. First of these, the Doda, has its source near the Pensi-la 4,400 m (14,400 ft) mountain-pass and flows south-eastwards along the main Zanskar valley leading towards Padum, the capital of Zanskar. The second branch is formed by two main tributaries known as Kargyag river, with its source near the Shingo La 5,091 m (16,703 ft), and Tsarap river, with its source near the Baralacha-La. These two rivers unite below the village of Purne to form the Lungnak river. 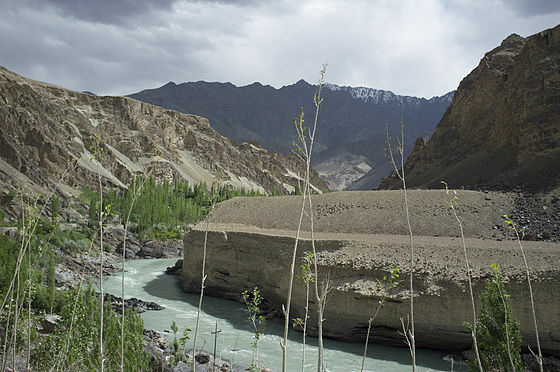 The Lungnak river then flows north-westwards along a narrow gorge towards Zanskar's central valley, where it unites with the Doda river to form the main Zanskar river. This river then takes a north-eastern course through the dramatic Zanskar Gorge until it joins the Indus near "Nimmu" in Ladakh. The Punjab, also spelled Panjab, is a geopolitical, cultural and historical region in South Asia, specifically in the northern part of the Indian subcontinent, comprising areas of eastern Pakistan and northern India. The boundaries of the region are ill-defined and focus on historical accounts. The Indus River Delta, forms where the Indus River flows into the Arabian Sea, mostly in the Southern Sindh province of Pakistan with a small portion in the Kutch Region of the Western tip of India. The delta covers an area of about 41,440 km², and is approximately 210 km (130 mi) across where it meets the sea. The active part of the delta is 6,000 km2 in area (2,300 sq mi). The climate is arid, the region only receives between 25 and 50 centimetres of rainfall in a normal year. The delta is home to the largest arid mangrove forests in the world, as well as many birds, fish and the Indus Dolphin. This river was known to the ancient Indians in Sanskrit as Sindhu and the Persians as Hindu which was regarded by both of them as "the border river". The variation between the two names is explained by the Old Iranian sound change *s > h, which occurred between 850–600 BCE according to Asko Parpola. From the Persian Achaemenid Empire, the name passed to the Greeks as Indós (Ἰνδός). It was adopted by the Romans as Indus. Asko Parpola is a Finnish Indologist and Sindhologist, current professor emeritus of Indology and South Asian Studies at the University of Helsinki. He specializes in the Indus script. The Santri are people in Javanese who practice a more orthodox version of Islam, in contrast to the more syncretic abangan. The major cities of the Indus Valley Civilisation, such as Harappa and Mohenjo-daro, date back to around 3300 BC, and represent some of the largest human habitations of the ancient world. The Indus Valley Civilisation extended from across northeast Afghanistan to Pakistan and northwest India,  with an upward reach from east of Jhelum River to Ropar on the upper Sutlej. The coastal settlements extended from Sutkagan Dor at the Pakistan, Iran border to Kutch in modern Gujarat, India. There is an Indus site on the Amu Darya at Shortughai in northern Afghanistan, and the Indus site Alamgirpur at the Hindon River is located only 28 km (17 mi) from Delhi. To date, over 1,052 cities and settlements have been found, mainly in the general region of the Ghaggar-Hakra River and its tributaries. Among the settlements were the major urban centres of Harappa and Mohenjo-daro, as well as Lothal, Dholavira, Ganeriwala, and Rakhigarhi. Only 90–96 of more than 800 known Indus Valley sites have been discovered on the Indus and its tributaries. [ citation needed ] The Sutlej, now a tributary of the Indus, in Harappan times flowed into the Ghaggar-Hakra River, in the watershed of which were more Harappan sites than along the Indus. The Indus river feeds the Indus submarine fan, which is the second largest sediment body on the Earth. It consists of around 5 million cubic kilometres of material eroded from the mountains. 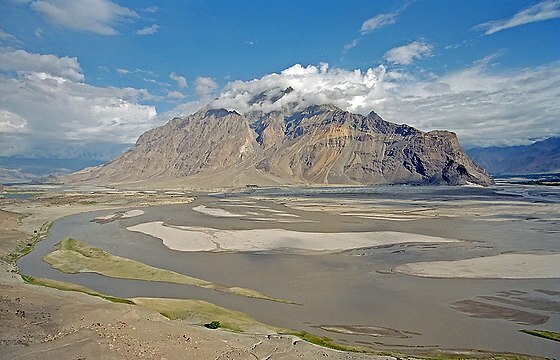 Studies of the sediment in the modern river indicate that the Karakoram Mountains in northern Pakistan and India are the single most important source of material, with the Himalayas providing the next largest contribution, mostly via the large rivers of the Punjab (Jhelum, Ravi, Chenab, Beas and Sutlej). Analysis of sediments from the Arabian Sea has demonstrated that prior to five million years ago the Indus was not connected to these Punjab rivers which instead flowed east into the Ganga and were captured after that time. Earlier work showed that sand and silt from western Tibet was reaching the Arabian Sea by 45 million years ago, implying the existence of an ancient Indus River by that time. The delta of this proto-Indus river has subsequently been found in the Katawaz Basin, on the Afghan-Pakistan border. In November 2011, satellite images showed that the Indus river had re-entered India, feeding Great Rann of Kutch, Little Rann of Kutch and a lake near Ahmedabad known as Nal Sarovar. Heavy rains had left the river basin along with the Lake Manchar, Lake Hemal and Kalri Lake (all in modern-day Pakistan) inundated. This happened two centuries after the Indus river shifted its course westwards following the 1819 Rann of Kutch earthquake. In the uppermost, highest part of the Indus River basin there are relatively few genera and species: Diptychus , Ptychobarbus , Schizopyge , Schizopygopsis and Schizothorax snowtrout, Triplophysa loaches, and the catfish Glyptosternon reticulatum. Going downstream these are soon joined by the golden mahseer Tor putitora (alternatively T. macrolepis, although it often is regarded as a synonym of T. putitora) and Schistura loaches. Downriver from around Thakot, Tarbela, the Kabul–Indus river confluence, Attock Khurd and Peshawar the diversity rises strongly, including many cyprinids ( Amblypharyngodon , Aspidoparia , Barilius , Chela , Cirrhinus , Crossocheilus , Cyprinion , Danio , Devario , Esomus , Garra , Labeo , Naziritor , Osteobrama , Pethia , Puntius , Rasbora , Salmophasia , Securicula and Systomus ), true loaches ( Botia and Lepidocephalus ), stone loaches ( Acanthocobitis and Nemacheilus ), ailiid catfish ( Clupisoma ), bagridae catfish ( Batasio , Mystus , Rita and Sperata ), airsac catfish ( Heteropneustes ), schilbid catfish ( Eutropiichthys ), silurid catfish ( Ompok and Wallago ), sisorid catfish ( Bagarius , Gagata , Glyptothorax and Sisor ), gouramis ( Trichogaster ), nandid leaffish ( Nandus ), snakeheads ( Channa ), spiny eel ( Macrognathus and Mastacembelus ), knifefish ( Notopterus ), glassfish ( Chanda and Parambassis ), clupeids ( Gudusia ), needlefish ( Xenentodon ) and gobies ( Glossogobius ), as well as a few introduced species. As the altitude further declines the Indus basin becomes overall quite slow-flowing as it passes through the Punjab Plain. Major carp become common, and chameleonfish ( Badis ), mullet ( Sicamugil ) and swamp eel ( Monopterus ) appear. In some upland lakes and tributaries of the Punjab region snowtrout and mahseer are still common, but once the Indus basin reaches its lower plain the former group is entirely absent and the latter are rare. 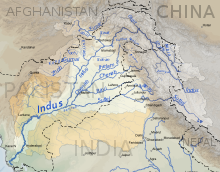 Many of the species of the middle sections of the Indus basin are also present in the lower. Notable examples of genera that are present in the lower plain but generally not elsewhere in the Indus River basin are the Aphanius pupfish, Aplocheilus killifish, palla fish (Tenualosa ilisha), catla (Labeo catla), rohu (Labeo rohita) and Cirrhinus mrigala . The last four are medium to large species that are important in fisheries and the last three have strongly declined. The lowermost part of the river and its delta are home to freshwater fish, but also a number of brackish and marine species. This includes including pomfret and prawns. The large delta has been recognized by conservationists as an important ecological region. Here, the river turns into many marshes, streams and creeks and meets the sea at shallow levels. The Indus Basin Project consisted primarily of the construction of two main dams, the Mangla Dam built on the Jhelum River and the Tarbela Dam constructed on the Indus River, together with their subsidiary dams. The Pakistan Water and Power Development Authority undertook the construction of the Chashma-Jhelum link canal – linking the waters of the Indus and Jhelum rivers – extending water supplies to the regions of Bahawalpur and Multan. Pakistan constructed the Tarbela Dam near Rawalpindi – standing 2,743 metres (9,000 ft) long and 143 metres (470 ft) high, with an 80-kilometre (50 mi) long reservoir. It supports the Chashma Barrage near Dera Ismail Khan for irrigation use and flood control and the Taunsa Barrage near Dera Ghazi Khan which also produces 100,000 kilowatts of electricity. The Kotri Barrage near Hyderabad is 915 metres (3,000 ft) long and provides additional water supplies for Karachi. The extensive linking of tributaries with the Indus has helped spread water resources to the valley of Peshawar, in the Khyber Pakhtunkhwa. The extensive irrigation and dam projects provide the basis for Pakistan's large production of crops such as cotton, sugarcane and wheat. The dams also generate electricity for heavy industries and urban centers. The Geography of Pakistan is a profound blend of landscapes varying from plains to deserts, forests, hills, and plateaus ranging from the coastal areas of the Arabian Sea in the south to the mountains of the Karakoram range in the north. Pakistan geologically overlaps both with the Indian and the Eurasian tectonic plates where its Sindh and Punjab provinces lie on the north-western corner of the Indian plate while Balochistan and most of the Khyber Pakhtunkhwa lie within the Eurasian plate which mainly comprises the Iranian Plateau. Gilgit-Baltistan and Azad Kashmir lie along the edge of the Indian plate and hence are prone to violent earthquakes where the two tectonic plates collide. The Ravi River is a transboundary river crossing northwestern India and eastern Pakistan. It is one of six rivers of the Indus System in Punjab region. The waters of Raavi are allocated to India under Indus Water Treaty. The Jhelum River is a river in Northern India and Eastern Pakistan. It is the westernmost of the five rivers of the Punjab region, and passes through the Kashmir Valley. It is a tributary of the Indus River and has a total length of about 725 kilometres (450 mi). The Chenab River, known traditionally as the Chandrabhaga River, is a major river that flows in India and Pakistan, and is one of the 5 major rivers of the Punjab region. It forms in the upper Himalayas in the Lahaul and Spiti district of Himachal Pradesh state, India, and flows through the Kishtwar, Doda, Ramban, Reasi and Jammu districts of Jammu region in Indian state of Jammu and Kashmir into the plains of the Punjab, Pakistan, before flowing into the Indus River near the city of Uch Sharif. The waters of the Chenab were allocated to Pakistan under the terms of the Indus Waters Treaty. The Sutlej River (Punjabi: ਸਤਲੁਜ, Sanskrit: शतद्रुम, , is the longest of the five rivers that flow through the historic crossroads region of Punjab in northern India and Pakistan. The Sutlej River is also known as Satadree It is addressed as Shatarudra by the Gorkhalis. It is the easternmost tributary of the Indus River. Panjnad River (Urdu/Punjabi Shahmukhi: پنجند, is a river at the extreme end of Bahawalpur district in Punjab, Pakistan. Panjnad River is formed by successive confluence or merger of the five rivers of the Punjab, namely Jhelum, Chenab, Ravi, Beas and Sutlej. Jhelum and Ravi join Chenab, Beas joins Sutlej, and then Sutlej and Chenab join to form Panjnad 10 miles north of Uch Sharif in Muzaffar Garh district. The combined stream runs southwest for approximately 45 miles and joins the Indus River at Mithankot. The Indus continues and then drains into the Arabian Sea. A barrage on Panjnad has been erected; it provides irrigation channels for Punjab and Sindh provinces south of the Sutlej and east of the Indus rivers. Sukkur Barrage is a barrage on the River Indus near the city of Sukkur in the Sindh province of Pakistan. The Barrage was built during the British Raj from 1923 to 1932 and was named Lloyd Barrage. The Sukkur Barrage, is the pride of Pakistan’s Irrigation system as it is the largest single Irrigation network of its kind in the world. It irrigates from Sukkur District in the North, to Mirpurkhas/ Tharparkar and Hyderabad districts in the South of Sindh, almost all parts of the Province except few. It is situated about 300 miles North East of Karachi, 3 miles below the Railway Bridge, or the Sukkur Gorge. The introduction of barrage-controlled irrigation system resulted in more timely water supplies for the existing cultivated areas of Sindh Province of Pakistan. 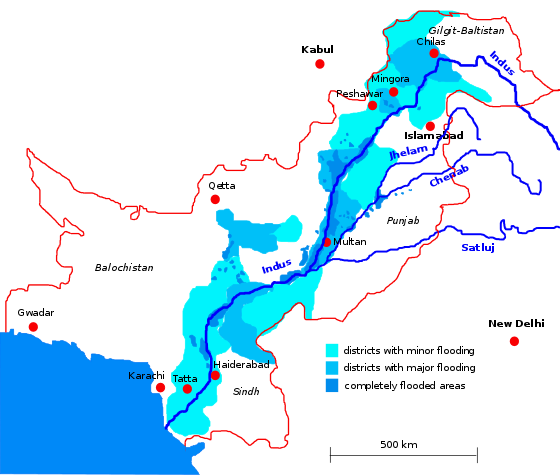 The Indus Waters Treaty is a water-distribution treaty between India and Pakistan, brokered by the World Bank to use the water available in the Indus System of Rivers located in India. The Indus Waters Treaty (IWT) was signed in Karachi on September 19, 1960 by the first Prime Minister of India Pandit Jawaharlal Nehru and then President of Pakistan Ayub Khan. Guddu Barrage is a barrage on the Indus River near Kashmore in the Sindh province of Pakistan. President Iskander Mirza laid the foundation-stone of Guddu Barrage on 2 February 1957. The barrage was completed in 1962 at a cost of 474.8 million rupees and inaugurated by Field Marshal Ayub Khan in 1962. Taunsa Barrage is a barrage on the River Indus in Taunsa Tehsil of Dera Ghazi Khan District, Punjab province of Pakistan. It is situated 20 kilometres southeast of Taunsa Sharif and 16 kilometres from Kot Addu. This barrage controls water flow in the River Indus for irrigation and flood control purposes. Taunsa Barrage was designated a Ramsar site on 22 March 1996. The Nadistuti sukta, "hymn of praise of rivers", is hymn 10.75 of the Rigveda. Trimmu Barrage is a barrage on the River Chenab in the Jhang District of the Punjab province of Pakistan. It is situated downstream of the confluence of the River Jhelum and River Chenab. It is situated some 25 km from the city of Jhang near the village of Atharan Hazari where the River Jhelum flows into the River Chenab. Rasul Barrage is a barrage on the River Jehlum between Jhelum District and Mandi Bahauddin District of the Punjab province of Pakistan. It is situated 72 km downstream of Mangla Dam. The Nara Canal is a deepened delta channel of Indus River in Sindh province, Pakistan. It was built as an excavated channel off the left bank of the Indus River into the course of the old Nara River. The canal runs from above the Sukkur Barrage through the Khairpur, Sanghar, Mirpurkhas and Tharparkar Districts to the Jamrao Canal. Nara is the longest canal in Pakistan, running for about 226 mi (364 km). It has a designed capacity of 13,602 cu ft/s (385.2 m3/s), but actually discharges 14,145 cu ft/s (400.5 m3/s). About 2,000,000 acres (8,100 km2) of land are irrigated by this canal. Within the Khairpur District, the canal and its associated wetlands were made into the Nara Game Reserve in 1972. Left Bank Outfall Drain is a drainage canal in Pakistan. Built between 1987 and 1997 using funding from the World Bank, the canal collects saline water, industrial effluents and Indus river basin floodwater from more than two million hectares of land of Shaheed Benazirabad, Sanghar, Mirpurkhas and Badin districts located in Nara river basin into the Arabian Sea. ↑ The Indus Basin of Pakistan: The Impacts of Climate Risks on Water and Agriculture. World Bank publications. 2013-05-01. p. 59. ISBN 9780821398753. ↑ "Geography: The rivers of Pakistan". Dawn. 26 September 2009. Retrieved 15 August 2017. ↑ "Indus water flow data in to reservoirs of Pakistan" . Retrieved 15 August 2017. ↑ Thieme, P. (1970), "Sanskrit sindu-/Sindhu- and Old Iranian hindu-/Hindu-", in Mary Boyce; Ilya Gershevitch, W. B. Henning memorial volume, Lund Humphries, p. 450 : "As the great frontier river that represents the natural dividing line between India and Iran, the Indus could most easily and fittingly be called Sindhu- 'Frontier' by the Indians and Hindu- 'Frontier' by the Iranians." ↑ Boyce, Mary (1989), A History of Zoroastrianism: The Early Period, BRILL, pp. 136–, ISBN 978-90-04-08847-4 : "The word hindu- (Skt. sindhu-), used thus to mean a river-frontier of the inhabited world, was also applied generally, it seems, to any big river which, like the Indus, formed a natural frontier between peoples or lands." ↑ Bailey, H. W. (1975), "Indian Sindhu-, Iranian Hindu- (Notes and Communications)", Bulletin of the School of Oriental and African Studies, 38 (3): 610–611, doi:10.1017/S0041977X00048138, JSTOR 613711 : "The word sindhu- is used of a 'mass of water' (samudra-), not therefore primarily 'flowing' water. Hence the second derivation of 'enclosed banks' is clearly preferable." ↑ Parpola 2015, Chapter 9. ↑ Mukherjee, Bratindra Nath (2001), Nationhood and Statehood in India: A historical survey, Regency Publications, p. 3, ISBN 978-81-87498-26-1 : "Apparently the same territory was referred to as Hi(n)du(sh) in the Naqsh‐i‐Rustam inscription of Darius I as one of the countries in his empire. The terms Hindu and India ('Indoi) indicate an original indigenous expression like Sindhu. The name Sindhu could have been pronounced by the Persians as Hindu (replacing s by h and dh by d) and the Greeks would have transformed the latter as Indo‐ (Indoi, Latin Indica, India) with h dropped..."
↑ "An A-Z of country name origins | OxfordWords blog". OxfordWords blog. 2016-05-17. Retrieved 2017-06-23. ↑ Holdich, Thomas Hungerford (1911). "Indus" . In Chisholm, Hugh. Encyclopædia Britannica . 14 (11th ed.). Cambridge University Press. pp. 507–508. 1 2 "Indus re-enters India after two centuries, feeds Little Rann, Nal Sarovar" . Retrieved 22 December 2017. ↑ Williams, Brian (2016). Daily Life in the Indus Valley Civilization. Raintree. p. 6. ISBN 978-1406298574. ↑ "Was the Ramayana actually set in and around today's Afghanistan?". ↑ Clift, Peter D.; Blusztajn, Jerzy (15 December 2005). "Reorganization of the western Himalayan river system after five million years ago". Nature. 438 (7070): 1001–1003. doi:10.1038/nature04379. PMID 16355221. ↑ Clift, Peter D.; Shimizu, N.; Layne, G.D.; Blusztajn, J.S. ; Gaedicke, C.; Schlüter, H.-U. ; Clark, M.K. ; Amjad, S. (August 2001). "Development of the Indus Fan and its significance for the erosional history of the Western Himalaya and Karakoram". GSA Bulletin. 113 (8): 1039–1051. doi:10.1130/0016-7606(2001)113<1039:DOTIFA>2.0.CO;2. ↑ Zeitler, Peter K.; Koons, Peter O.; Bishop, Michael P.; Chamberlain, C. Page; Craw, David; Edwards, Michael A.; Hamidullah, Syed; Jam, Qasim M.; Kahn, M. Asif; Khattak, M. Umar Khan; Kidd, William S. F.; Mackie, Randall L.; Meltzer, Anne S.; Park, Stephen K.; Pecher, Arnaud; Poage, Michael A.; Sarker, Golam; Schneider, David A.; Seeber, Leonardo; Shroder, John F. (October 2001). "Crustal reworking at Nanga Parbat, Pakistan: Metamorphic consequences of thermal-mechanical coupling facilitated by erosion". Tectonics. 20 (5): 712–728. doi:10.1029/2000TC001243. 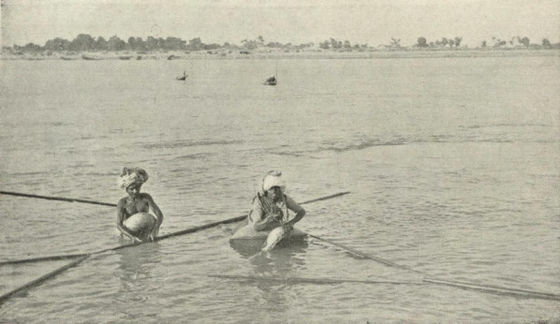 1 2 "Indus River" (PDF). World' top 10 rivers at risk. WWF. Archived from the original (PDF) on 25 May 2013. Retrieved 11 July 2012. ↑ "WWF – Indus River Dolphin". Wwf.panda.org. Retrieved 2012-09-22. ↑ Khan, W.A. ; Bhagat, H.B. (2010). "Otter Conservation in Pakistan". IUCN Otter Spec. Group Bull. 27 (2): 89–92. 1 2 3 4 5 6 7 Mirza, M.R. ; Mirza, Z.S. (2014). "Longitudinal Zonation in the Fish Fauna of the Indus River in Pakistan". Biologia (Pakistan). 60 (1): 149–152. 1 2 3 Sheikh, M.; Laghari, M.Y. ; Lashari, P.K. ; Khooharo, A.R. ; Narejo, N.T. (2017). "Current Status of Three Major Carps (Labeo rohita, Cirrhinus mrigala and Catla catla) In the Downstream Indus River, Sindh". Fisheries and Aquaculture Journal. 8 (3). doi:10.4172/2150-3508.1000222. ↑ "Tarabela Dam". www.structurae.the cat in the hat. Retrieved 2007-07-09. ↑ "Indus Basin Project". Encyclopædia Britannica. Retrieved 2007-07-09. ↑ "Technology Breakthroughs for Global Water Security: A Deep Dive into South Asia" . Retrieved 24 December 2018. 1 2 Amjad, A. Shah; Kasawani, I.; Kamaruzaman, J. (2007). "Degradation of Indus Delta Mangroves in Pakistan" (PDF). International Journal of Geology. 1 (3): 29. Retrieved 24 December 2018. ↑ "Indus Delta, Pakistan: economic costs of reduction in freshwater flow" (PDF). International Union for Conservation of Nature. May 2003. ↑ "Pakistan's water economy: getting the balance right". July 2018. ↑ Walsh, Declan (2010-10-21). "Pakistan floods: The Indus delta". The Guardian. ↑ Walsh, Declan (2010-10-05). "Pakistan's floodwaters welcomed along Indus delta". The Guardian. ↑ "River basin development phases and implications of closure". CiteSeerX 10.1.1.485.4832 . ↑ "Integrated Water Resource Systems: Theory and Policy Implications" (PDF). Retrieved 22 June 2018. ↑ "Indus River Delta". World Wildlife Fund. Archived from the original on 2012-01-23. ↑ "Global warming benefits to Tibet: Chinese official. Reported 18 August 2009". 17 August 2009. Archived from the original on 23 January 2010. Retrieved 4 December 2012. ↑ Farrow, Ronan (2018). War on Peace: The End of Diplomacy and the Decline of American Influence. W. W. Norton. ISBN 978-0393652109. ↑ "SEPA orders polluting factory to stop production". Dawn. 3 Dec 2008. Retrieved 28 June 2012. ↑ "Fishing poison killing Indus dolphins, PA told". Dawn. 8 Mar 2012. Retrieved 27 April 2016. ↑ "'18 dolphins died from poisoning in Jan'". Dawn. 1 May 2012. Retrieved 28 June 2012. ↑ "Threat to dolphin: Govt bans fishing between Guddu and Sukkur". The Express Tribune. 9 Mar 2012. Retrieved 28 June 2012. ↑ "Almost all plastic in the ocean comes from just 10 rivers - 30.11.2017". DW.COM. Retrieved 2018-08-22. about 90 percent of all the plastic that reaches the world's oceans gets flushed through just 10 rivers: The Yangtze, the Indus, Yellow River, Hai River, the Nile, the Ganges, Pearl River, Amur River, the Niger, and the Mekong (in that order). ↑ Schmidt, Christian; Krauth, Tobias; Wagner, Stephan (2017-10-11). "Export of Plastic Debris by Rivers into the Sea". Environmental Science & Technology. American Chemical Society (ACS). 51 (21): 12246–12253. doi:10.1021/acs.est.7b02368. ISSN 0013-936X. PMID 29019247. ↑ "Indus Basin Floods" (PDF). Asian Development Bank. 2013. Retrieved 20 November 2018. ↑ Bodeen, Christopher (8 August 2010). "Asia flooding plunges millions into misery". Associated Press. Retrieved 8 August 2010. ↑ Guerin, Orla (7 August 2010). "Pakistan issues flooding 'red alert' for Sindh province". British Broadcasting Corporation. Retrieved 7 August 2010. ↑ "BBC News – Pakistan floods: World Bank to lend $900m for recovery". bbc.co.uk. 17 August 2010. Retrieved 2010-08-24. ↑ "BBC News – Millions of Pakistan children at risk of flood diseases". bbc.co.uk. 16 August 2010. Retrieved 2010-08-24. ↑ "Pakistan floods: Oxfam launches emergency aid response". BBC World News South Asia. 14 September 2011. Retrieved 15 September 2011. 1 2 "Floods worsen, 270 killed: officials". The Express Tribune. 13 September 2011. Retrieved 13 September 2011. ↑ "Government to launch Kandhkot-Ghotki bridge over River Indus next month: Sindh CM". The Express Tribune . Retrieved 1 August 2016. ↑ "Pakistan: Getting More from Water (see Page 50)" (PDF). World Bank. Retrieved 29 March 2019.